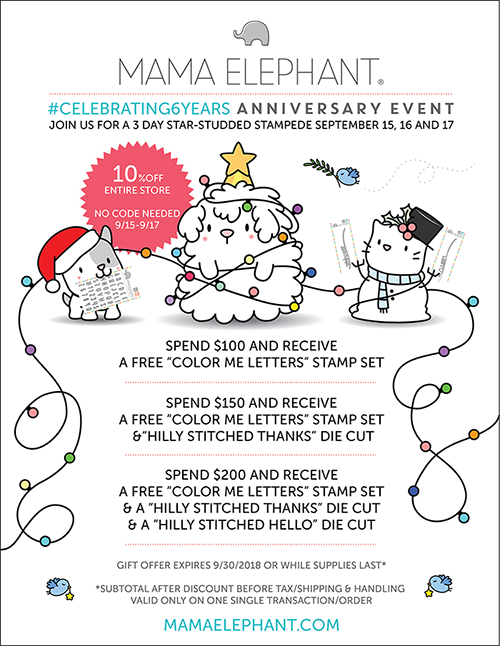 Hello and welcome to Mama Elephant’s #celebrating6years Anniversary Release Stampede with our wonderful crafty friends and designers! I have two cards for you today: one is a no-line watercolor penguin scene inspired by nursery illustration styles and the other is a bold alcohol ink + foil holiday card. The wait is finally over! The release is now live and available for purchase in the shop! I have a huge admiration for nursery illustrations and children’s book illustrations. But whenever I try to color critter scenes, I end up going bold or dark. For this card, I intentionally went light and tried my best to capture it in these photos. All images from Cool Penguins were stamped with a light gray ink, with some masking involved. I watercolored using Daniel Smith Extra Fine Watercolors. My second card is a bit bolder than my usual work. I used Joy Ornaments with coordinating dies for this. You’ll hardly see me use red in my work because it’s not a color I’m drawn to. If you want to learn more about alcohol inks (and especially foiling), I’d recommend checking out Jessica Frost-Ballas’s YouTube, she has several videos explaining it better than I could. I used various shades of red and gold inks on Yupo paper and added gold foil after it was dry (it sticks to any sticky areas, how cool is that?) I love alcohol inks, but I hardly have the time to use them. Next on the hop is Noriko Fairchild. Fabulous cards Rubeena! Love the no line coloring and the bold background against the golden die cuts! Thanks for the inspiration! Fabulous watercolouring on the first penguin card! Your JOY card is so like a Chinese New Year celebration in its colour scheme! Fabulous cards! Your watercolouring is gorgeous! Oh, these penguins are absolutely adorable! The arrangement of them all in the scene is just perfect, and I love the colors you chose. The alcohol ink and foil card is striking! You are super talented! I love your no-line watercoloring. It looks so dreamy and happy!! I really need to try this, and alcohol inks, too…all in good time! Until then, I am just going to admire your cards! 🙂 Those penguins, though!! Super cute no line coloring! Great cards, I especially love the penguin card!!! Beautiful cards! You did a fabulous job watercoloring those penguins! I love the soft color palette you used.